We have been pretty busy getting everything going with Data discovery since our last update so apologies for the lack of posts. 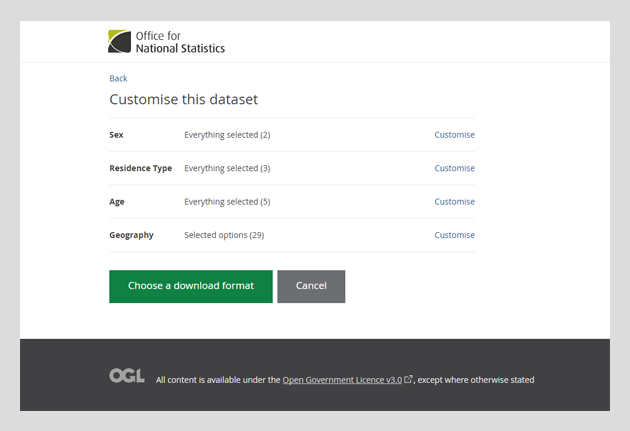 Here is an (overdue) update on our Data Discovery work and the ongoing enhancements to the ONS website. From the latest sprint we have today deployed the latest updates to our performance platform aiming to help us to better measure how the website is being used and be transparent about how it is performing. We have included more metrics for our website analytics, given more context to our publishing times and removed some metrics that, whilst potentially interesting are not a good measure of how things are going. the correction order in content changed to show the latest correction notice first. This alpha has been the major focus for the whole team and the early sprints have been spent roughly into 3 main areas. The ‘slice and dice’ of datasets on the front end, developing the database and data model (building on previous work in this area), and investigating the process of splitting and loading potentially large CSV files into this database. To date the user facing parts of the system are being developed as a mix of HTML prototypes and InVision mock-ups to allow us to get these in front of users as quickly as possible and iterate on the results of testing rapidly. The most evolved of these prototypes is around giving users the ability to customise data before downloading and a lot of the thinking to date is shown in this prototype from the last sprint. Some of this, particularly around the geographic selector, has already moved on as a result of testing and has been part of what we are focussed on during the current one. In addition to this we have been looking at how we will integrate this functionality into the current site, with it being properly part of the site rather than separate tools, and how we can offer improved routes for users to ‘discover’ these datasets.